The 72 inch cooling fan power cord by GardTec is NEMA 1-15P, featuring a two-prong design for 125v circuits. 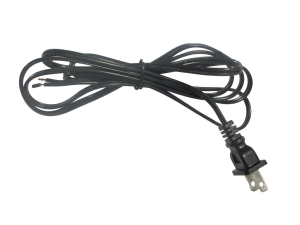 With a heavy duty construction this cord supplies your cabinet cooling fan with power. Its essential to keep your cabinet cooling fan running to prevent internal electronics and components from overheating. Buy in bulk and receive a GardTec discount! Browse our selection of fan power cord, fan filter assembly and cooling fans in one in our GardTec cabinet cooling fan kits.